This Classic Ragu Bolognese is our most successful recipe to date and was given to Michela while filming ‘Simply Italian’ in Italy. So easy to follow the real secret to this dish is the simmering for 3 hours. It changes the taste as the meat is soft and tender and no tinned tomatoes are needed! You wont ever cook ragu any other way. 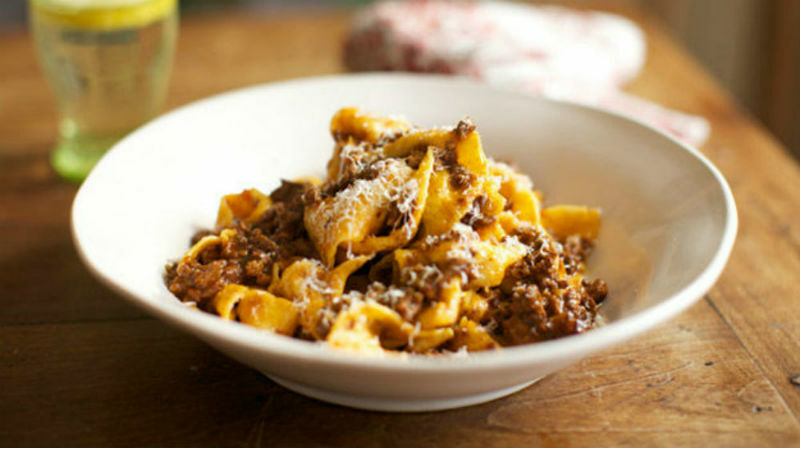 This recipe is fantastic to make in a large batch and then freeze in individual portions – it takes time to make a really tasty ragu so it’s worth making lots so you can enjoy after a hard day’s work! Heat the sauce from frozen. POUR in the red wine and keep stirring for 2 minutes until the alcohol has evaporated. ADD the tomato purée and stir into the sauce, then add 500ml of boiling water from the kettle and crumble in the beef stock cubes and the bay leaves. SIMMER slowly for 3 hours with the lid ON to let the flavours intensify and the beef break down.